Its not much to look at yet, but this wood is going to be transformed in lockers for the Malahide Tennis club. More pictures to follow as the build progresses. We were asked by Dublin City Council to make a prototype raised herb garden for a local senior citizens home, which is being collected today. Hopefully this will be rolled out to more retirement homes across the city soon. When Picasso wanted his fence painting he called this guy! 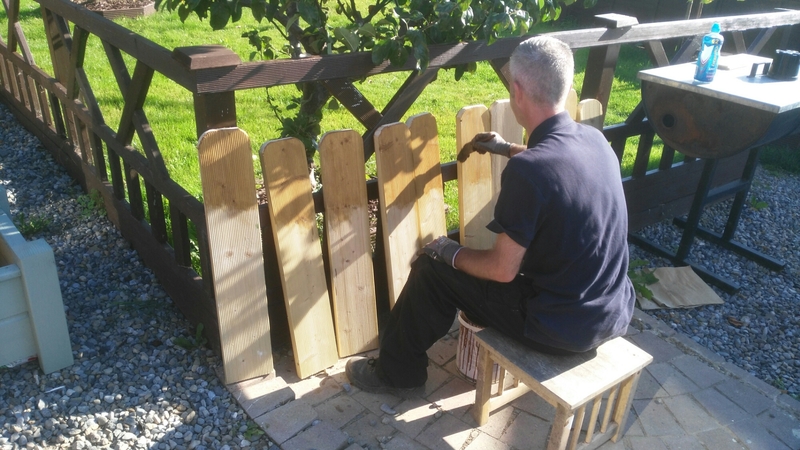 The Dublin County Council workers came to take collection of 2 picnic table benches and 5 pre-stained and planted large planter box’s this morning. We have just completed 4 picnic tables ready for delivery tomorrow. Two are going to Dublin City council, one for the Priorswood Men’s Shed and one for a local resident. Posted on Aug 10, 2016 Aug 10, 2016 Leave a comment on Picnic tables. The lads from Dublin City Council dropped by to pick up a few more 3 seater benches this week. Welcome to the new PACE Social Enterprise Blog. We have been producing 100’s of large planter-boxes for Dublin City Council over the last few months, you might have noticed them in your area, let us know here if you have and send us a photo too. We would love to see them in their new spots as we are proud of our work. recently we have built a made to order Gazebo for the Merchants Arch Ireland project as well as some tables, stools and benches for them. Posted on Aug 10, 2016 Leave a comment on Welcome to the new PACE Social Enterprise Blog.